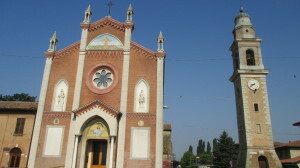 The Veneto region offers a variety of cycling experiences and varied terrain. 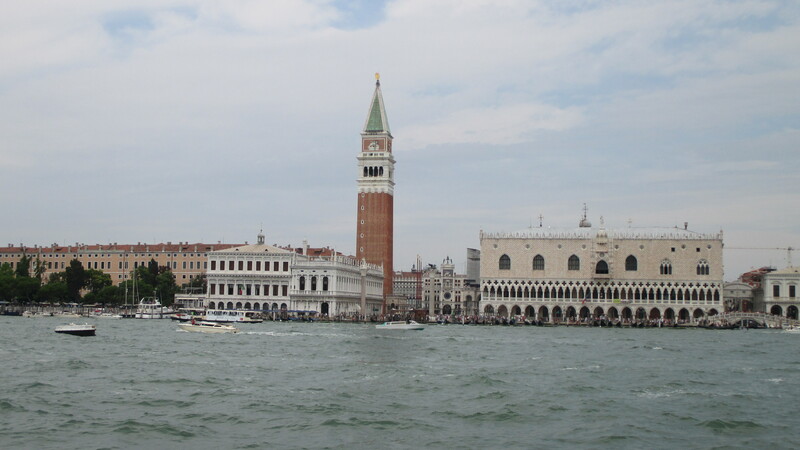 We were encouraged by the work that Italy had done to rejuvenate a dying river, the Po, into a recreation area and wildlife preserve and decided to take a look, with our final destination being Venice. 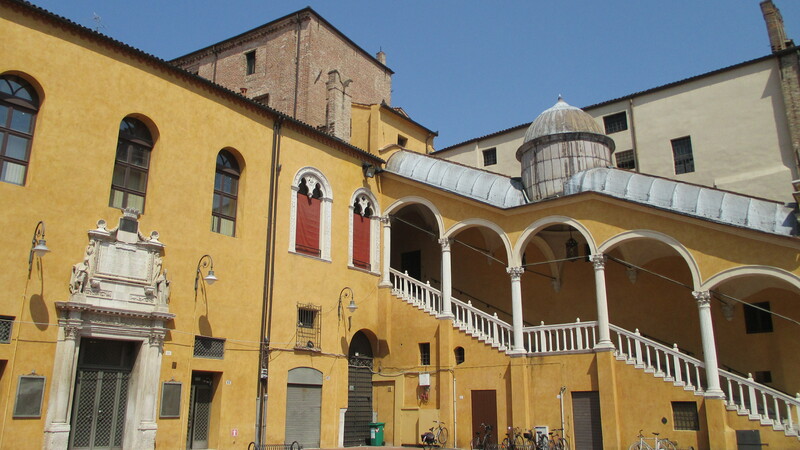 We arrived at the Venice Airport and from there, took a bus to Mestre and a train to Ferrara, where we were to begin our journey. We had arranged to rent our bikes from Veloce Bike Rentals and they were delivered, as scheduled, right to our hotel. 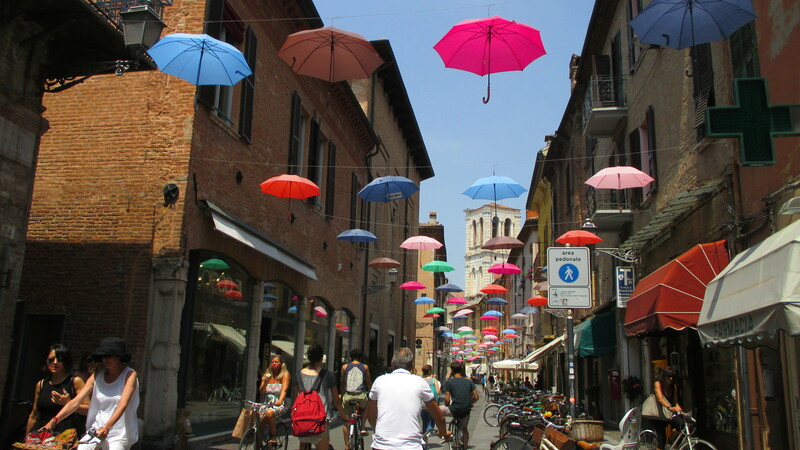 We spent a day riding around Ferrara, which is a bicycle mecca. Nearly 90% of the residents own bikes and there is a network of cycle paths and signposted routes, including a circuit of the city’s medieval walls. The Castello Estense is not to be missed. 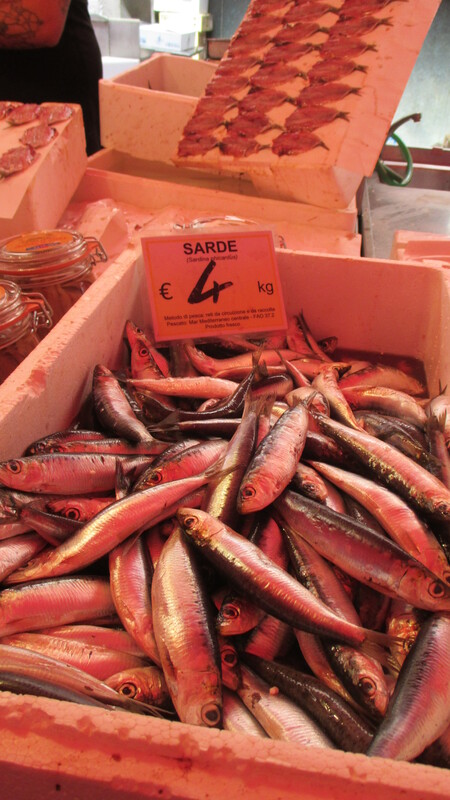 When not cycling around town, we enjoyed strolling the cobbled streets and enjoying the sights and the food. Ferrara was a surprise. We had never heard of Ferrara, before we planned this trip. 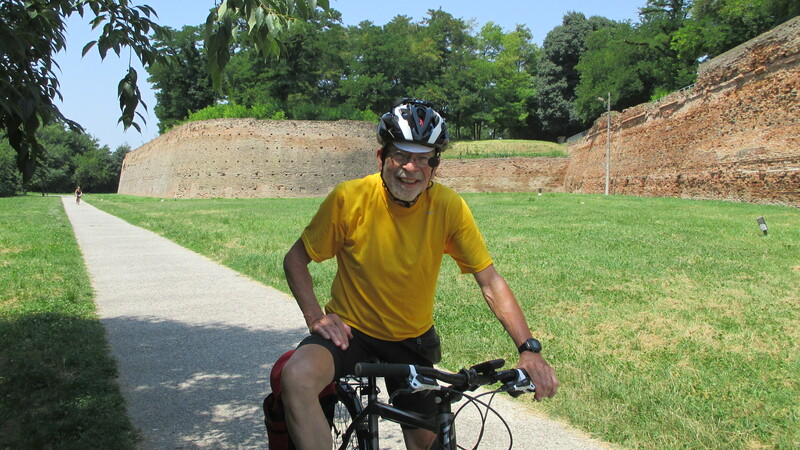 This is not a long ride; but, takes us on and around the ancient walls and through various section of the old city. It’s a good way to get acquainted, stretch the legs and get accustomed to our rental bikes. Pretty much the entire route is on a paved bike path. Our trip was in July and we were aware of the heat in this region at this time of year. We set out for the day with plenty of fluids and there are not many places to stop for refreshments along the way. There are a few trailside covered picnic tables, which were welcome, especially for the tiny bit of shade they offered. 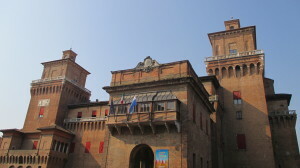 We headed out of Ferrara center on a straight road, which led to the town wall. From there we turned left and rode to the 1st stop sign, where we turned right and went under the wall above and on across the road and onto a paved trail. That was easy! We take the 1st right and follow the path. The highway is beyond the hedge to our right about 100 yards and there is a park area to our left. We follow to the T junction and make a left. The path continues through the countryside and some small towns and crosses back and forth across the road. Just outside Frangolino, about 10km from the start, we ride up on the path to a dyke path. 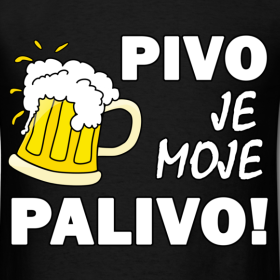 We will be following the PO River all day today on our left. It is mostly farmland on the right. 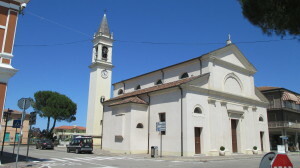 Due to the heat, which was over 100 degrees, we had planned to stay in the small town of Serravalle. There was not a big sight seeing event here; but, it turned out to be a wonderful place to stay. 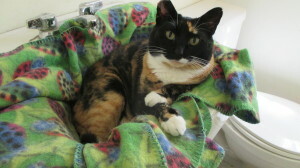 We were welcomed at the bakery and ushered to our air conditioned apartment, over the bakery. Yeah for air conditioning! After a wonderful dinner, prepared by our hosts, we roamed through town and had an ice cream and then returned to our air conditioned apartment for a welcome nights sleep. After breakfast, provided by the bakery, it was easy to find our way back up to the dyke path and we were on our way to the port of Goro. All signs indicate Destra Po. The Po was to our left and farmland to our right. After about 9.4km the path leads down for a stint on the roadway for about three and a half km. Fortunately, the traffic was not heavy. Then it was back up to the path. We are back at the roadway at about about 17.7km for an option to visit an Archeological site. We opted out and continued on and were back on the path at about 20.5km. At 21km, we turned off to make a stop in Mesola, which was just off the bike path. This is a larger town than Serravalle; but, was just too far for us the 1st day in the heat. It does have more amenities. There is a nice center square, as well as a castle, a lovely church, and a well equipped Tourist Information office. It’s also a good stop for refreshments. 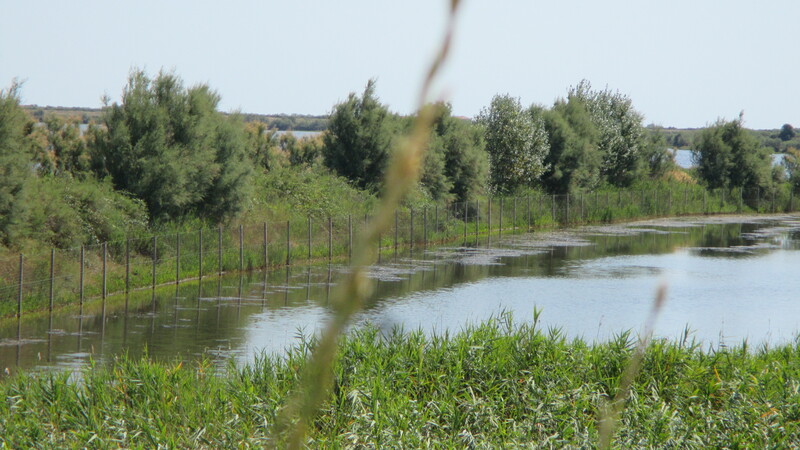 We are now in the Po Delta Park and Nature Reserve. We return back to the dyke path until about 29.9km, where the path splits and we head down to follow a small road past a few homes and farms. This diversion was a bit puzzling, as we did not see any special site; but, eventually this diversion takes us beside a small tributary and we are back up to the Destra Po at 34.3km. This part is shared with vehicles and we are on this until we reach the outskirts of Goro, at 38.7km. We made our way to our lodging, which was just a short walk to the port. Many fishing vessels are docked here and there are a number of water or cycling excursions that leave from here. 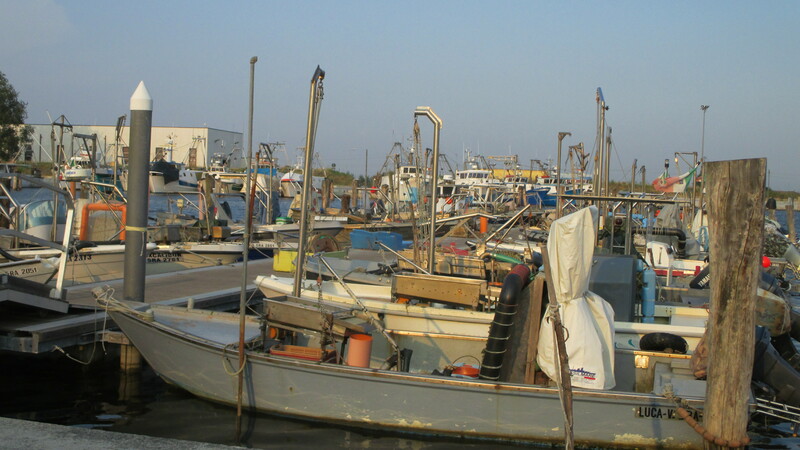 We did a little sight seeing in town and then before dinner, we strolled along the docks and watched various vessels unloading and re-packing their catch of the day for it’s trip to the big city restaurants and markets. Next morning, we did the familiar winding through town to get back to the dyke path. Again the Po River is to our left on the path; but, we are sharing with vehicles for a while; but, not many. As we leave the town below behind us, the path becomes cycles only and we are definitely seeing more cyclists today. 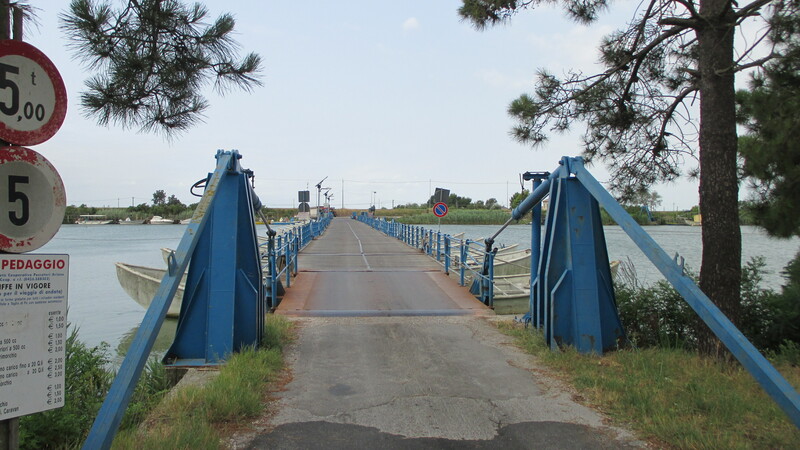 Just after 5km into the ride, we turn off left and just ahead is a “floating” bridge. The wooden planks are positioned on top of side by side boats the span the waterway. Bow and stern points extend on either side of the planks. These interesting and bumpy narrow bridges are used by both cycles and cars. Very intriguing! They make a good functional and economic way to bridge some rural watery expanses. We make a right turn at the Y following the bridge and then down and around to ride down a small road. We stay on this road until we turn off left at about 8.3km onto a smaller road, which brings us up to switchback and down to another “floating” bridge, much like the 1st. We turn right after the bridge and ride on a small road. Now the river is to our right. We follow this, as it flows into an inlet. 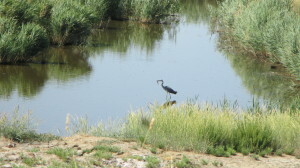 We ride beside fishing shacks and enjoy watching the various species of birds across the fields. 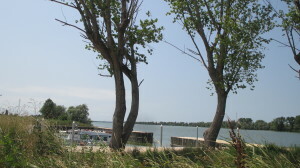 At about 22km, we turn off at a marina park. There is a regional signpost map to study and we took this opportunity to have a snack. There is a restaurant here as well; but, our snack was enough to sustain us for now. We then set out again on the road, beside this inlet. At about 226k, we turn off left, which took us away from the inlet and past fields. Again, another left. We were glad to have our GPS, as some of this area looks very similar and very flat, so it could have been confusing. Finally at 28k, we cross reach a crossroads with direction sign and turn right. We ride through Ce Mello. At 31.6km we get a nice two way bike path; beside and nicely separated from the road. There are even some picnic benches provided alongside. Oops, careful here! At 34km the path continues; curving and continuing over a long bridge. We will be returning and taking this tomorrow; but, for today we backtrack just a bit to a crosswalk so we can take the roadway. At the T and stop sign we cross left and a red brick path/sidewalk takes us straight into Porto Tolle. This is not a pretty entrance, as there is a fenced off old derelict structure to the left; but, the town itself was neat and tidy and was a good place to stay. We never seemed to hit the Tourist Information office, when it was open that day; but, roamed around town and along the raised path overlooking the river. We also never seemed to find much of a “Port” in Porto Tolle. The Po River actually has several separate branches that make their way to the delta. We are following a route today that takes us over a branch, just out of town and then meanders on both small roads and paths to reach Rosalina. Beware the very busy highway SS309 beside Rosalina and carries lots of truck and auto traffic toward and away from the port at the delta. We took special care to avoid this. 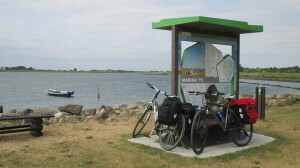 We left Porto Tolle by simply retracing our ride straight out of town to the bike path we had left the day before. We can see the bridge up ahead that we will be crossing. The bike path curves around an over a highway and then over the Po River at about 2.3km. There is a nice space for cyclists, safely separated from vehicles on this long bridge. We continue until the turnoff left to Venier. This is a quieter road. 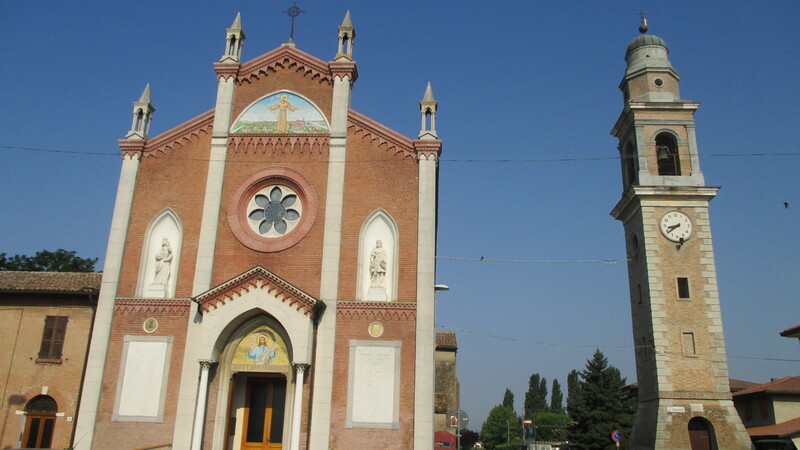 So, about 7.4km from today’s start, we reach Venier, where we stopped at the pretty church. From the grounds of the church we could look back across the Po to where we started today. We rolled on out of Venier and then over another small bridge over a river tributary and then an expanse of water. Then we turn off right, just after and are on a smaller and more quiet road. This is were we spot the first little bike route signs we have seen. This is within the nature preserve park and periodically there are signs identifying the park and with just a few steps one can climb a dyke to our right for a better view of the water. This whole area is dotted with fields and marshes and inlets; perfect for the protected bird species. More bike route signs at 17.4 and 17.8km. We made a number of stops to try to capture the birds with our camera and just to take in the views. At 19k we round a turn at a breakwater an Adriatic inlet opens to our right. We stopped at 22.9km at a little marina park with restaurant. It was nice to walk around and study the informative park signpost. Also time for a snack and drink on this hot day. Then we were off, passing more inlets, marshes and birds. Suddenly we find ourselves entering Porto Levante at 26.3k. This has a big, busy marina and was a shock after riding through such a quiet area all day. From here, we are on the roadway without a bike lane. 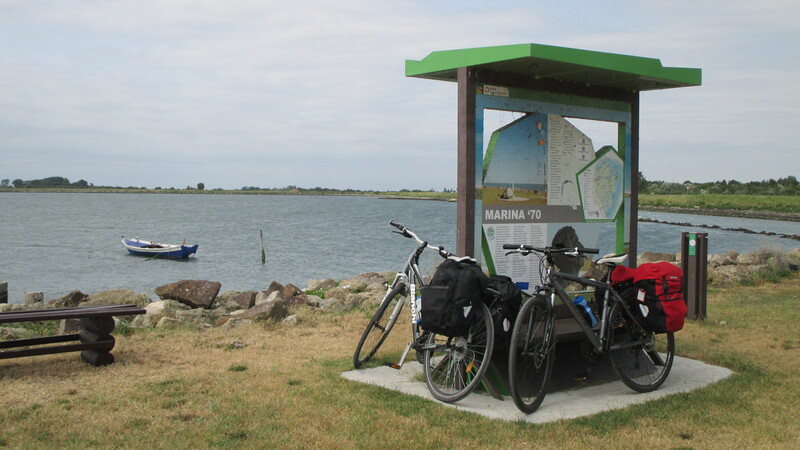 At 29.6km we ride past another much smaller marina and town. At 36.5km we keep right. We are making our way Rosalina. The main highway to the coast is very busy and this is where we enter Rosalina. Yikes! We were happy to get across. The town itself is quiet. We found a way out of Rosalina that took us through side streets and avoided the crazy SS309. We went through town on the main street, past the park and then turned left. We go through the stop light. A right turn at this cross street would have taken us to the rail station and the super market. We make a left at a bout .8km and then a right and meander through neighborhoods until we reach the highway at about 1.3km and carefully cross left. This is a busy road; but, nothing like the SS309. We make the 1st right turnoff and then the road curves up and over the SS309. We take the 1st turnoff right, after crossing over the SS309 and are on a somewhat quieter road. There are crop fields and then waterways on both sides. We stay on this until about 9.5km and just after the Parco sign, we turn off left. It is nice to be on a quiet road. Soon we were seeing more cyclists as the roadway takes us past inlets and marshland. 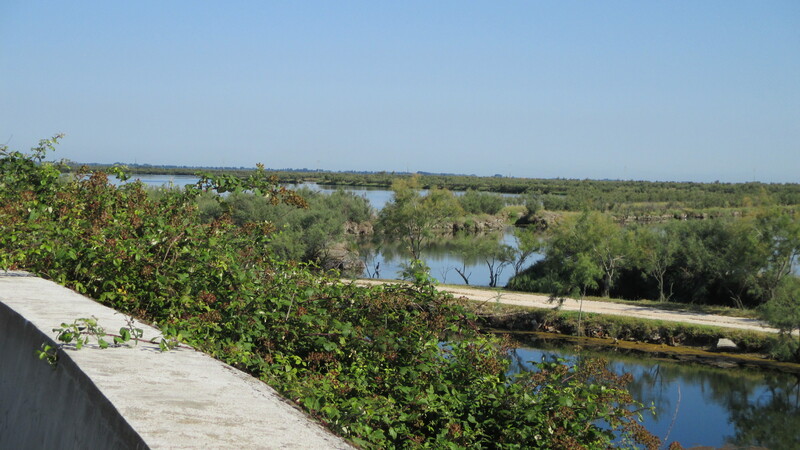 There are lots of opportunities for bird watching today as we ride through this protected Po Delta protected park area. At about 14km we encounter a number of parked vehicles beside the dune to our right and stairways leading up and over the dune for access to the water. At one point, a crew was busily loading bags of shellfish via conveyer belt onto trucks going to the market. At 17.4km we are beside the water and we’ve seen more cyclists today then on the whole trip. At about 22.1km we abruptly reach a stop sign and highway, where we carefully cross to a rough dirt and gravel path. This takes us left with the highway below. At 24.9 we are thankful to be on a small paved road that we follow up to the busy SS309 bridge to cross the Po. The option is either to ride or use the walkway. At the end of the bridge we turn right and this brings us back down on the opposite side as the gravel path we had been on. We turn left at about 32k and away from the river. This alternates between small country road and unpaved farm road. At 33.6km we reach a stop sign and T and turn right and then ride on through a small town. Traffic does pick up and we are beside a busy road as we near Chioggia. At about 37.3 we see our next busy bridge to cross. There is a bike lane; but, also a walkway. 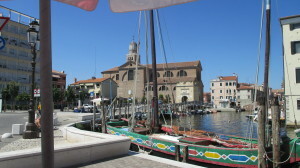 Just after we take a side road are soon in the outskirts of Chioggia. Soon there are some periodic dual bike lanes as we near the main road into town. It’s a bit confusing, negotiating across the main road and roundabout for the final stretch into the old town. At 41.7km we cross the bridge into the center and there is a wide walkway or one can cycle on the bridge. We are happy to divert from the main road in the center to find out lodging beside one of the canals. 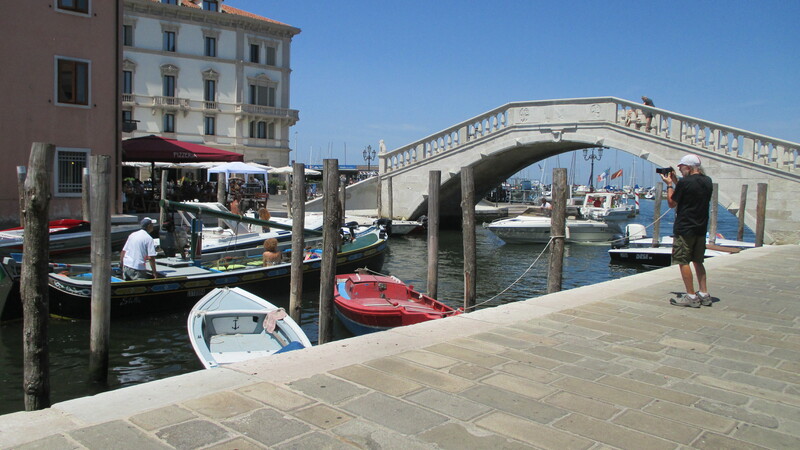 Chioggia is like a mini Venice, with several colorful canals and lots of sights to see. We arrived during the annual Festival of the Fishes. What a delight! As dinner time approaches, the main streets becomes a pedestrianized restaurant with seafood being the featured offering. Menus are posted and once we make a choice and pick up a tray, we queue up with the mass of other diners and once we have our selection, we tuck in with the locals in the provided tables for a fresh and delicious meal and conversation. We left room for a gelato, of course, as we strolled along, enjoying the entertainment. What an evening. 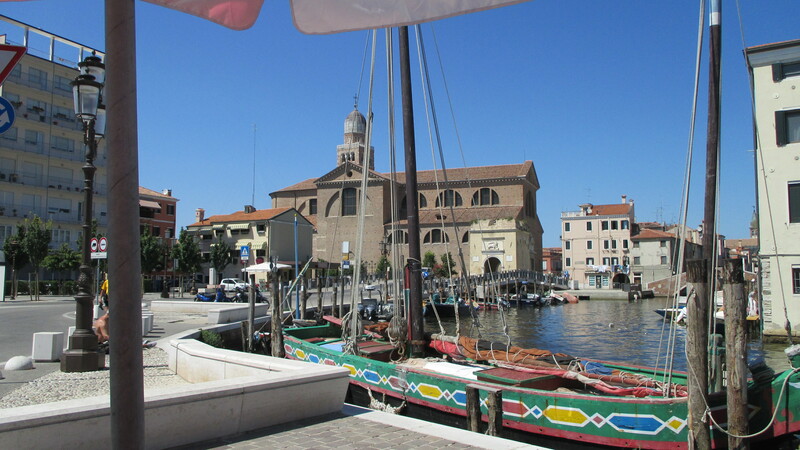 Chioggia has a wonderful fish market, lovely churches, boat filled canals, great food and a vibrant and busy harbor. 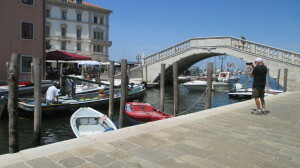 It is from this harbor that we will be catching our ferry to start our journey to Venice. We head to the harbor, buy tickets and await our first ferry of the day. This takes pedestrians and cycles ONLY. 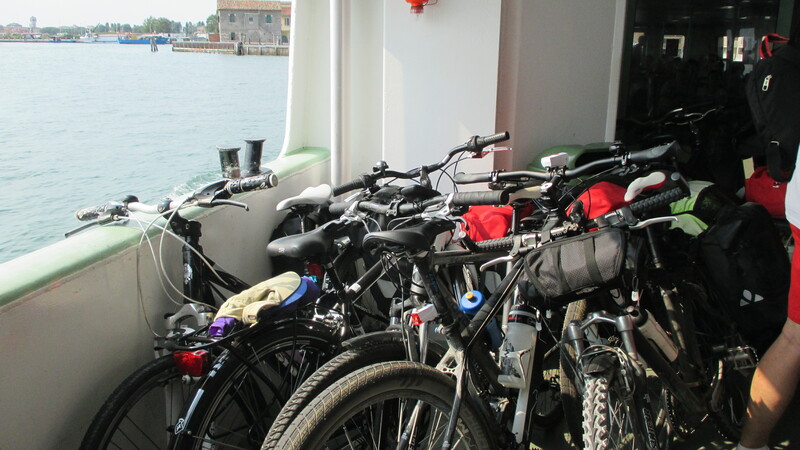 The ferry is filled with other cyclists and we quickly make acquaintance with some Germans and also some Californians and compare notes of where we are from, where we have been and where we are going. 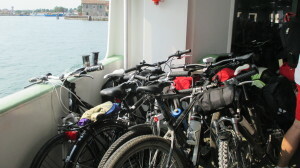 After a short ferry ride, we arrive at Pellestrina for a ride up the island to catch the next ferry. One can either take the direct route used by cars and buses, up the highway or the more scenic route through some small towns and mostly next to the water. We opted for scenic. After about 9.2km we reach the next ferry landing. This is a larger vessel, which takes vehicles. 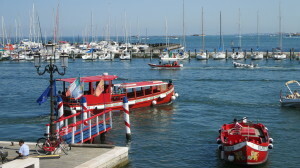 This takes us to Lido, where we begin the ride with the Adriatic to our left. 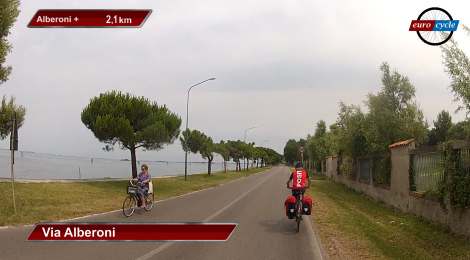 At about 10.5km we are on the roadway a bit, before returning to a nice wide bike lane after Malanocco. Then onto a dual bike path on the left at about 15.3. At about 17.6, we are beside the water again. We ride past beaches and casino’s. 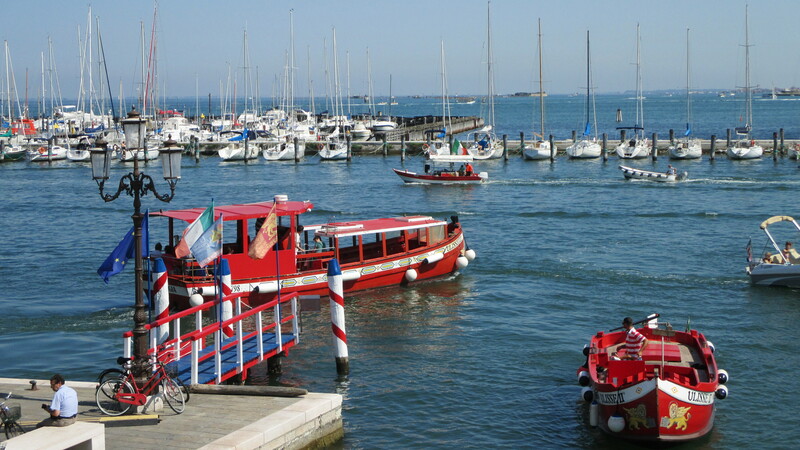 This is where Venetians and visitors go to play. We follow the sign to the Ferry office on the main harbor, where ferry tickets are purchased. 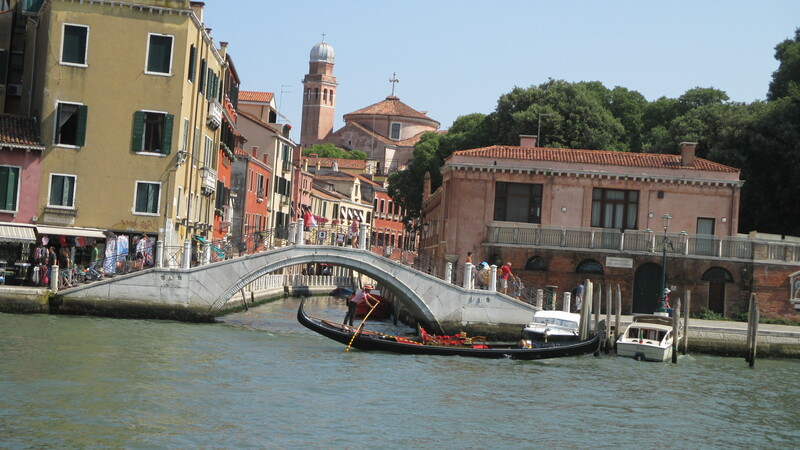 Our ferry into Venice Tronchetto landing is down the road a ways. This is the largest ferry of today and carries vehicles, bikes and walk on passengers. 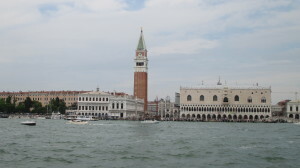 The view of San Marco square and the familiar sights of Venice are awesome, as we make our way to the ferry landing. This is where the big cruise ships moor, as well. 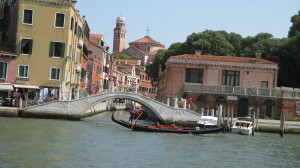 The “People Mover” transports most of the foot traffic to the big parking area, Via Roma, just across the footbridge into Venice. We exit the ferry with our bikes and after the traffic has cleared, we make our way to the roadway that takes us up and over to the parking area. We have arranged to meet our bike rental agent here and then we make our way on foot over the new bridge, then past the iconic rail station and to our hotel. From here, we have plenty of sight seeing to do on foot. Bikes are not allowed in Venice.